What Is Frozen Shoulder Syndrome? Frozen shoulder, or adhesive capsulitis, is a condition that causes restriction of motion and pain in the shoulder joint. 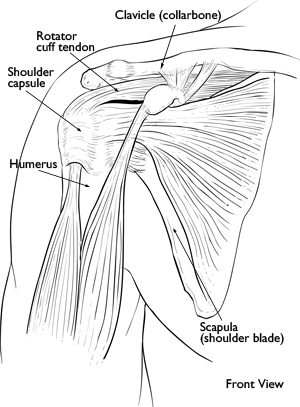 When a patient develops a frozen shoulder the capsule surrounding the joint contracts and bands of scar tissue called adhesions are formed within the joint. The contraction of the capsule and the formation of the adhesions cause the shoulder to become stiff and movement to become painful. There is great variation in the severity and length of symptoms. Untreated, on average the symptoms last 2-3 years in total before going. In some cases it is much less than this. In a minority of cases, symptoms last for several years. Weakness in your shoulder, upper arm and back muscles will occur over time from lack of use; this can create an imbalance in your muscle strength (as the stronger muscles have to compensate for the weaker ones) and cause muscular strains and alignment issues. Who Does Frozen Shoulder Syndrome Affect? Frozen Shoulder affects about 1 in 50 adults at some stage in their life, and usually affects women more than men and often occurs between the ages of 40 -60 years. Patients will experience severe loss of motion in the shoulder with pain that can travel down the arm and into the wrist. Usually the pain is dull and achy but can become sharp and severe with sudden movements. Lying on the affected side and lifting the arm above the head can cause the pain to become worse, making sleep and daily activities difficult. Stiffness will progressively get worse and can last for many months unless treatment occurs. Either shoulder can be affected but most commonly it is the non-dominant shoulder. That is, the left shoulder in a right-handed person. In about 1 in 5 cases the condition also develops in the other shoulder at some stage. What Causes Frozen Shoulder Syndrome? Often times there is no known injury or cause and in these cases poor postural alignment of the shoulder girdle and head and neck can increase pressures on the shoulder leading to pain, inflammation and possible frozen shoulder over time. People with diabetes and thyroid conditions are at risk for development of this condition. How is Frozen Shoulder Syndrome Diagnosed? How can Frozen Shoulder Syndrome be Treated? Seeing a chiropractor for a non-invasive treatment and mobilization of the shoulder can restore movement and restore the ability to participate in daily activities once restricted by frozen shoulder. Particularly, this is where chiropractic manipulation has an advantage over other specialties. Chiropractic used in the treatment of frozen shoulder addresses the most practical issue of all: getting the body to move easier, and the person back to an active lifestyle. Once the body is aligned and can move with fewer restrictions, the need for pain-relieving and anti-inflammatory medications is either decreased or eliminated. As experienced chiropractors in Augusta GA, Georgia Clinic of Chiropractic has helped countless patients with frozen shoulder syndrome, including those who have previously tried other methods of treatment unsuccessfully, such as cortisone shots or physical therapy. At Georgia Clinic of Chiropractic, we want you to remain in control of your health, which is why our consultations are always free. Before any type of treatment is administered, it is always explained in detail, particularly with how it affects your specific health condition. If you’re suffering from frozen shoulder syndrome, or a similar condition, you can call our friendly staff to get started with your free consultation today with a chiropractor in Augusta GA today. Georgia Clinic of Chiropractic treats a wide range of conditions, including plantar fasciitis, tendonitis, IT Band Syndrome and torn meniscus. To watch videos of our patients’ experiences and the conditions they were treated for, visit our website. Augusta GA Chiropractor Georgia Clinic of Chiropractic provides customized chiropractic care. Visit our main website at www.georgia-clinic.com for a chiropractor in Augusta GA and a chiropractor in Evans GA that specializes in customized treatments.